I usually go to art shows to look at fashion, but last week I went to a fashion show to look at art. The actress Chloë Sevigny held her first runway show for Opening Ceremony in a SoHo church rec hall, and she brought in pieces by the artist Charlie Wing. It was his first show, too, and he set the stage with thick sod on which a nun in orange camouflage held a crossbow next to choirboys shearing a lamb whose horns were lit with LED. Though the figures, rather than chiseled marble, are plastic mannequins dressed in nylon, they have a baroque Pietà’s calm mystery–a sense of eternity replaced by a whiff of the absurd. The composition is strong. There is movement in the static and beauty in the horror. It is a sculpture. It doesn’t merely take up room, it makes space. The next day, I went to the museum to see some fashion. So it is: Performance wants to be art, art wants to be performance, fashion wants to be fiction, or sculpture or architecture, and everyone wants to be philosophy–who only wants to be popular, so she squeezes herself into the constraining corset of catchphrases. Out of these petty jealousies beauty sometimes emerges: Painting aspired to be like music, totally abstract but still stirring, and it got there. At least Rothko did. When objects aspire to the status of literature, however, the results are less convincing. Narrative is by necessity imposed on images and everything must “tell a story.” But stories are bound to time and must unfold, while objects are borne in space and can be apprehended instantly. It seems rather perverse to put yourself under the whip of time when you were free from its lashings. 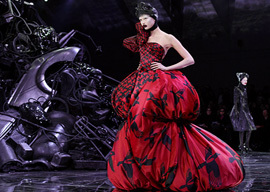 Like McQueen’s accessories, it shows our tendency toward the masochistic—a tendency that has become a style. Fifteen years later it is still prettily trickling down the runway, simplified for mass production and streetwear in the Chloë Sevigny show’s torturing shoes and laser-cut leather. Actually, it’s more like a hundred and fifty years later—McQueen certainly didn’t start the flow. Baudelaire and Poe may have, with their carrion and their prostitutes and their nevermore and their n’importe où hors du monde (“anywhere outside the world”). It’s all right for a dress to be romantic, but critics by now should know better. The n’importe ou loin d’ici is really too old-fashioned, and even in the nineteenth century it wasn’t a philosophy so much as a pathology. The dresses are not good because they are something other than dresses or something more than dresses. They are neither more powerful nor more political than Balenciaga or Yves Saint Laurent. And the show is neither more nor less “avant-garde” for being shown in cramped galleries with distressed walls than the Balenciaga exhibit was last fall in a Park Avenue building with wall-to-wall carpet and regular old glass cases.